An ecomaine employee pulls plastic bags from the recycling steam at the nonprofit’s center in Portland, April 7, 2013. ecomaine says careless recycling is increasing costs for towns. Careless recycling is costing taxpayers more, and some towns are trying to reach residents who recycle everything from maggot-infested lobster shells to worn-out pet beds. The Portland Press Herald reports Maine recycling nonprofit ecomaine says such “wish-cycling” is now costing taxpayers $35 to $70.50 per ton. 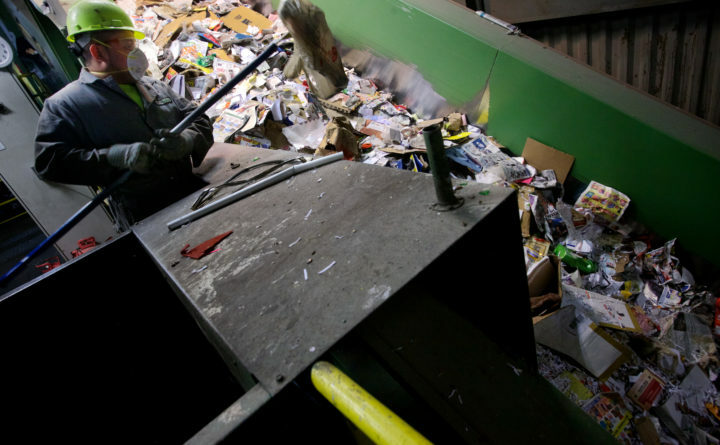 Rates of recycling contamination are dropping, and recycling keeps waste out of landfills. But ecomaine still sees some truckloads containing 50 percent nonrecyclable items, like plastic bags. Ecomaine faces a $300,000 revenue shortfall and says contamination makes it harder to sell recyclables. China last year disrupted global recycling markets by reducing how many imported recyclables can be contaminated. Ecomaine last year sold residential mixed paper to Chinese recyclers, but it’s now paying to send residential mixed paper to Indian, Vietnamese and Indonesian recyclers.